Dr Tyler attended the Post Conflict, Cultural Heritage and Regional Development Peace Conference to discuss the re branding of the city of Belfast. 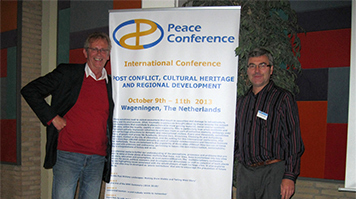 Dr Duncan Tyler (Principal Lecturer in Tourism, Hospitality and Leisure) delivered a paper entitled 'Belfast: A Brand Too Soon' to the Post Conflict, Cultural Heritage and Regional Development Peace Conference in Wageningen, Netherlands. Dr Tyler was invited to join the Scientific Committee of the conference along with Karel Werdler of our partners at InHolland University two years ago and a successful conference was attended by over 80 delegates from 23 countries from Asia, North America, Africa and Europe. Wageningen brands itself as ' The Peace Town' as it was here that the German Surrender document was signed at the end of World War 2. The town is also known for the Allies' Airborne attack that was thwarted by the Germans and made famous in the book and film called 'A Bridge Too Far'. The town takes it role in promoting Peace very seriously and hosts the Netherland's annual Remembrance Day on May 4th followed by the celebratory festival to mark the end of the war on May 5th. Dr. Tyler's paper considered the issues of branding Belfast to the tourism and foreign investment markets as part of the post Troubles peace process. In particular, he questioned whether the branding of the city and the creation of named 'quarters' was too early as the City's and neighbourhoods' identities were still under negotiation and construction. The paper was stimulated by the field visit last November to Belfast by the MSc International Tourism and Hospitality Management students who studied the city's recent tourism marketing and product development. The field trip was so successful that it is now an annual fixture and this year we are being joined by staff and students our French partners ESHotel School in Paris.